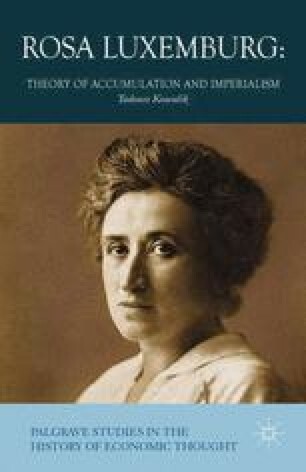 We recall Rosa Luxemburg’s critical remarks on the Marxian analysis of capitalism: the accusation of ignoring the role of money in the reproduction of total capital; assuming identity between production and conditions of realization as well as between realization and accumulation of surplus value; the omission of growth of the organic composition of capital, etc. Her criticisms concerned either exclusively the expanded reproduction scheme or the form of analysis that we find in the last part of the second volume of Capital. Her frequent argument was that the Marxian analysis of reproduction and of the circular movement of aggregate social capital contained in the II volume of Capital contradicts the analysis found in other parts of Marx’s work.